It's been a couple of weeks I'm reading you and it's high time I introduce you my colt : COLOR NOTCH UP, one of the extremely rare colored TB in France and probably the only one that will be in the track for the 20 or 30 past years (I think Mont Blanc' sons or daughters must have ran at that period). He's 2 yo (taking 3 next year) and he's just started the training. He's an Airdrie Apache's grand-son. I plan to make him race by spring (If I can go through all the difficulties to make a skewbald horse run in France ! ... ). I live in Chantilly, the french horse race temple, very close to the hippodrome. Your English is very good and we will be eagerly awaiting updates on your lovely horse in his racing career! WOW What a gorgeous double patterend TB!! He looks 1/2 sabino and 1/2 overo. 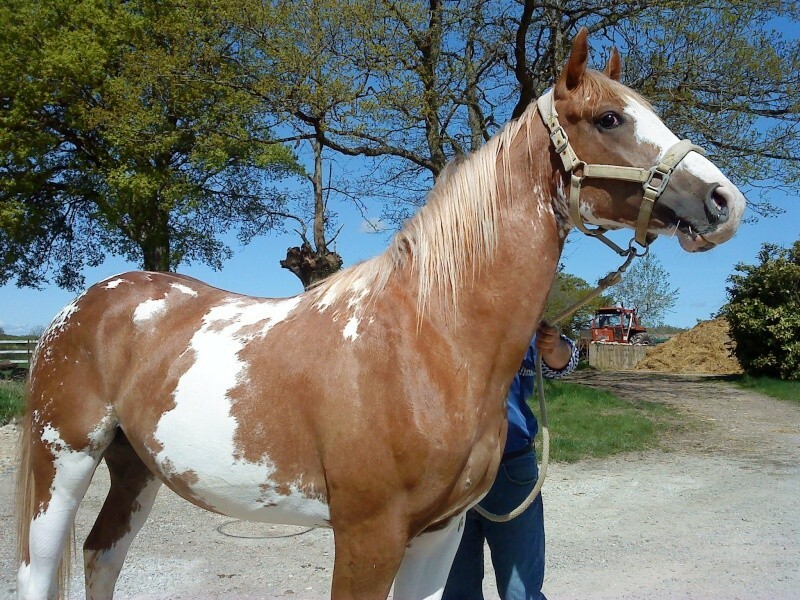 Have you tested him for the overo gene? Very best of luck to you with him OTT. Possibly 2 of ours so far could make it to the track in 2010. A very exciting time, beautiful colt!! Welcome and thank you for sharing. PS, I'm very impressed that you could figure out how to post a photo here, Congrads again! You are quite welcome Vanessa. Great photos and beautiful equines. Apropos Mont Blanc's era, by any chance, do you have any historical information on the final whereabouts of an obscure cropout heavily spotted French Thoroughbred from the early 1960s named: Valençay ? Nice to see you finally posted here Vanessa. I was the one that gave Vanessa this link to get lots of information about colorful TBs. Yes, he has been tested (Animal Genetics) : he's negative Sb1 and negative OLWS. PS, I'm very impressed that you could figure out how to post a photo here, Congrads again! Glad to see you finally made it Vanessa! Welcome, and I'm sure you will fit in well. Actually the test for LWO is a test for the gene itself. If the horse is positive for it, it's a frame overo regardless of what it looks like (I've seen solids test positive). By the same token, there are horses that may look like they should be positive, but they test negative. 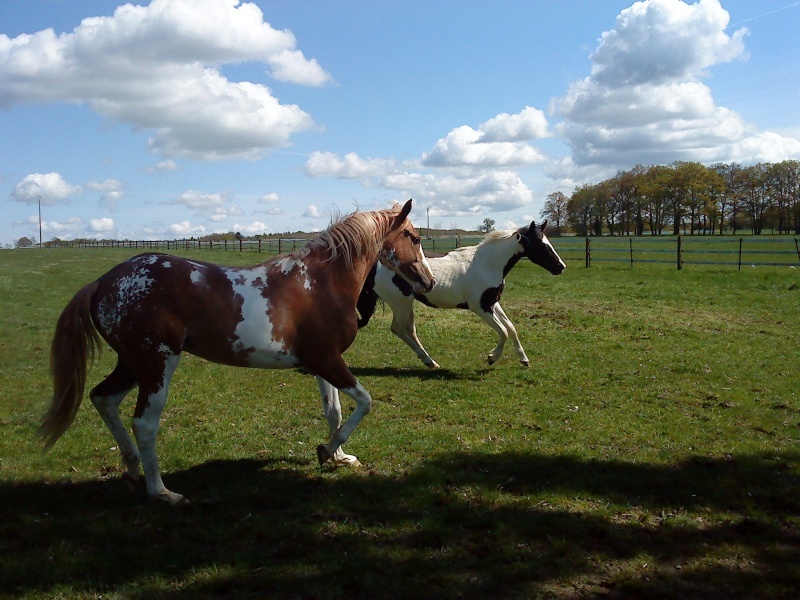 Those horses patterns are caused by another gene. It's rare, but it happens. Someone with a trained eye is not often fooled though. Your horse doesn't look sabino or LWO to me. He looks exactly like what his pedigree tells us he likely is... dominant white. Almost identical to his grandsire and several other known dominant whites. Just going to ditto ACC as she said everything I wanted too. Welcome Vanessa, so glad to see you here! I LOVE your colt! He's so beautiful! Vanessa do you mind if I link one of his photos to his pedigree? Hi Vanessa... you have a gorgous colt. I look forward to hearing about him as you get him to the track! Summerhorse, yes for sure you can link all pictures you want. "Dominant white", I didn't know this pattern. I believed my colt was sabino. All TBs are dominant white or are there true sabino TBs ? 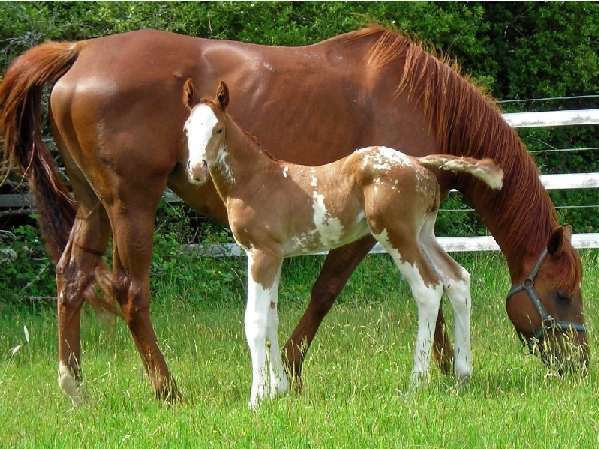 I know PH which are OLWS N/N (and definitively skewbald) with parents O/N : are they're still frame overo or are they dominant white ? 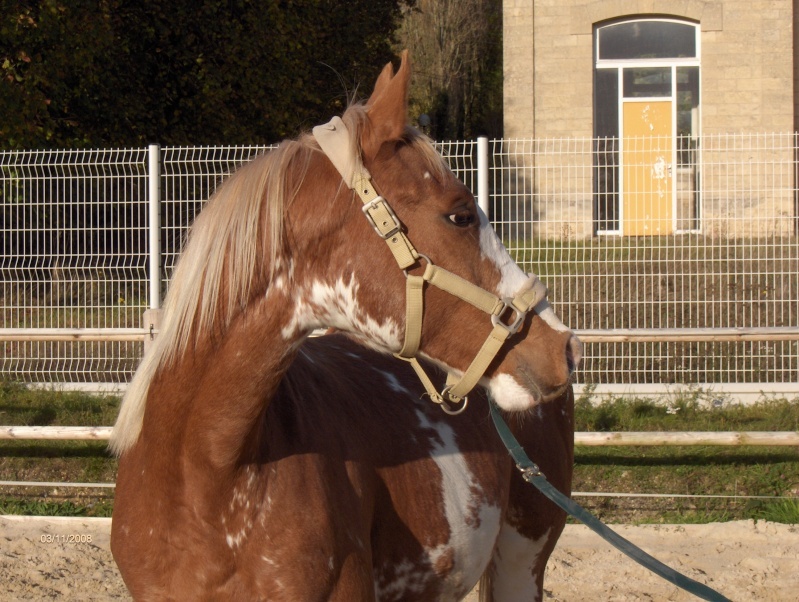 How can you see a horse is dominant white without knowing its genealogy ? There are true sabino TBs. We (and others) can see dominant white by knowing how the pattern "works" so to speak. How it "places" white on the horse. How the white "flows/moves" on a horse. How its passed on from sire to offspring or dam to offspring. And while we don't have a test for this particular horse, his sire, his sires production, and on down the line all match up VERY VERY closely to the known dominant white horse. Its not really ONE thing, but rather a combination of multitudes of things. 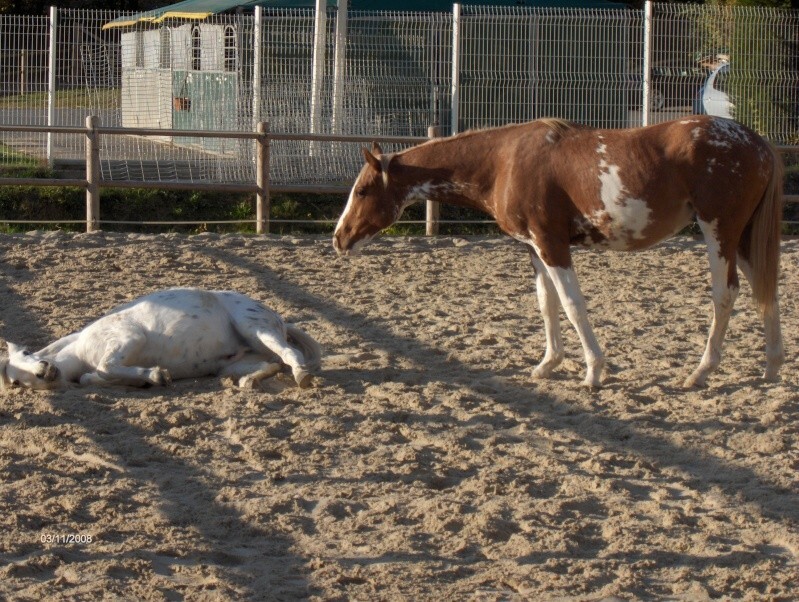 Dominant white will depend on everything that made us think that your colt was dominant white. Frame on the other hand is simple. If the horse is O/n the horse is a frame overo. It may have other patterns in ADDITION to frame, but the horse IS frame. Same thing with NN. If a horse is NN for frame, the horse is not frame no matter WHAT it looks like. It may have other patterns, but it's not frame. Welcome to the MB, Vanessa. Your colt is beautiful. Your English is definitely better than my French!! !